Produced in house with our modern CNC machinery ensures the body and stainless steel rod with fittings provides a perfectly fitting serviceable and upgradeable replacement part. This wastegate actuator is assembled with a predetermined actuator spring suitable for or slightly above factory boost levels. The actuator can be assembled with a stronger spring upon request. Please contact us directly concerning this process and we will be happy to help with your requirement. It is designed and built with the intention of increasing the boost output of a turbocharged system. We cannot guarantee compatibility with all applications, nor the ability to increase the boost output beyond a level that is within the parameters set by the engine-management-system of the given vehicle at the time of installation, whether that system is factory or aftermarket. The pressure figures listed in the drop down menu above are minimum regulated pressure figures. If you are unsure please dont hesitate to call us on 01924 360260. The Pumaspeed Workshop team are ready to fit the Forge Focus RS 2.3 Ecoboost Alloy Adjustable Wastegate Actuator in our Head Office located here. Therefore making parts and labour a total cost £312.98 (inc. VAT). 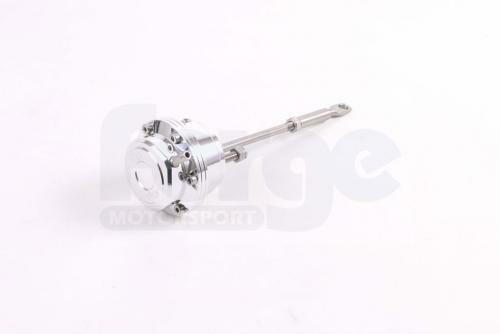 Pumaspeed have a specialist distribution team that can dispatch the Forge Focus RS 2.3 Ecoboost Alloy Adjustable Wastegate Actuator to any destination worldwide.